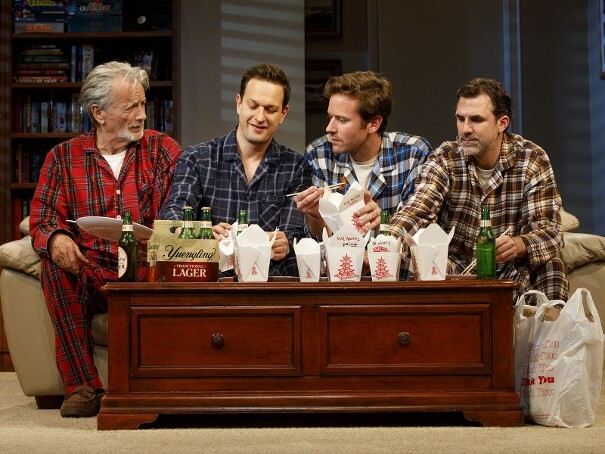 Stephen Payne as Ed, Josh Charles as Jake, Armie Hammer as Drew and Paul Schneider as Matt in Straight White Men. In other words, neither one is part of the primary demographic group in this country, straight white men, and that loud bothersome music just shows how environments are often created without a thought about others. Straight White Men is the first Broadway play written by an Asian woman, Young Jean Lee, and it's about success and self-esteem shown through a straight white family. The time is Christmas and three brothers are reuniting at their Midwest childhood home where their retired father, Ed (Stephen Payne), a widower, lives with Matt (Paul Schneider), his eldest son, who just moved back home. Visiting are Jake (Josh Charles), a brash, affluent banker, now divorced, and writer/teacher Drew (Armie Hammer). Both are successful in the eyes of society. On the other hand, Matt, a Harvard graduate and the family's intelligent golden boy, is puzzling. He has no career, no goals, he works as a temp in a non-profit company and craziest of all, has moved back with his father and does the shopping, cleaning, cooking.... What's up with him? The play takes place in the family den, the site of many years of rough macho horseplay, a well-worn room with shelves of board games and DVDs and faux leather furniture probably originally bought to withstand scars of three rambunctious boys. The set, designed by Todd Rosenthal, resembling an exhibit in an historic museum with "Persons in Charge," (Dafoe and Bernstein), acting as museum guides. They occasionally appear to check scenes changes, and in one case, Bornstein carefully places a blanket over Armie, passed out on the sofa. As the play proceeds, their intermittent appearances feel gimmicky. Skilled actors with comic skills, Jake and Drew stand out as they fall back into their juvenile roughhousing and dance moves, kudos to choreographer Faye Driscoll. They urge Matt to join them in a hilarious protest parody he once wrote of "Oklahoma" with a KKK chorus line. The second act moves into more serious territory after they see Matt crying during Christmas dinner. They each has his own theory as to why Matt would cry. Grown men don't break down and cry. Ed says that Matt has serious student debt and needs money. Drew suggests therapy for clinical depression. Jake says Matt has no ambition and should focus on a goal and gain confidence. The men are all part of a privileged life with savvy parents and they know what defines success and how uneven life is. Their late mother had created a board came called "Privilege" that spelled it all out, "Monopoly"-style. Under Anna D. Shapiro's direction, the plot, such as it is, stagnates as Matt listens to the repetitive suggestions. He is satisfied with his menial job, does not want anything more and refuses to accept money from his father. His lack of ambition is obvious when his father persuades him to join in a mock job interview. Ed plays the interviewer and Matt answers the questions. To demonstrate, Jake shows how to delivers persuasive interview. When Matt tries, his attempt is lackluster. While both brothers show compassion and are worried about Matt, they each grow contemptuous of his satisfaction to just be "useful." Josh Charles (The Good Wife) shows Jake's convincing arrogance, coming across strong with Hammer's charismatic Drew. Each has had their own personal barriers to overcome, Jake with his recent divorce and Drew who is having trouble with his latest book and admits he once considered suicide. Matt will not let them help him and we never find out if, or what has happened to him, but Schneider's nuanced portrayal is a clear example of the one family member who cannot fit into the jigsaw puzzle of what makes a man significant. As the father, Ed, Payne shows his quiet happiness to have his boys home, and wryly indulges their horseplay. He hangs Christmas stocks on the mantle as he always did, stuffing them, as usual,with peppermint candy canes and socks. He makes them all wear plaid flannel pajamas on Christmas Eve, just like always, and like them, he is puzzled and dismayed at Matt's apathetic life. His final words to Matt are heartbreaking, " I feel like I haven't done a good job as a father." Straight White Men is generous with comic moments but there is an undercurrent of melancholy as it ponders the questions of a successful life and the identities placed on us by the powers of straight white men. Previews: June 30, 2018. Opening: July 23, 2018.